All are $10.00 unless otherwise noted. Ck, MO or Paypal accepted! Thanks for looking!!! Suede leather wraps, fit most wrists. 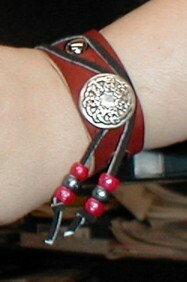 Celtic or fancy main button, studding, close with wrap leather tie (loop around button). Some have beaded or skull bead tails. 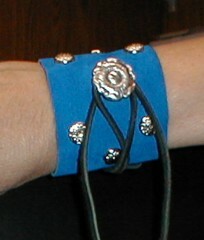 Bracelet 11 - blue - floral button, studs. 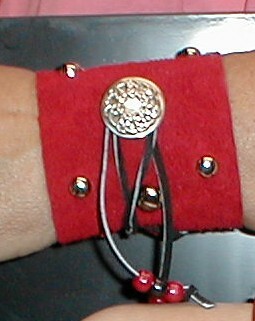 Bracelet 13 - blright red, studs, celtic button. Bracelet 12 - rust/marroon, narrow.